Expedition 13 crew consisted of the ISS commander Pavel Vinogradov of Russia and Flight Engineer and Science Officer Jeffrey Williams of the US. 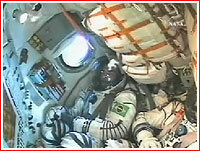 During the launch onboard Soyuz TMA-8 they were joined by the first Brazilian astronaut Marcos Pontes. Pontes was expected to return to Earth with the Expedition 12 crew after around a week onboard the station. 2006 March 30: The Soyuz-FG rocket, carrying the Soyuz TMA-8 spacecraft with the 13th long-duration crew of the International Space Station, blasted off from Site 1 in Baikonur Cosmodrome on March 30, 2006, at 06:30:20 Moscow Summer Time and successfully reached orbit nine minutes later. After a two-day solo flight, the Soyuz TMA-8 docked to the nadir (Earth-facing) docking port of the Zarya control module of the International Space Station on April 1, 2006, at 08:19 Moscow Time (04:19 GMT). The expedition 13 also tasked to conduct two spacewalks -- one from the US segment wearing EMU suits and one from the Russian segment wearing Orlan-M suits. 2006 June 2: Pavel Vinogradov and Jeff Williams conducted a 6-hour 31-minute spacewalk out of the Pirs docking compartment to repair a vent for the station's oxygen-producing Elektron unit, retrieval of experiment results and replacement of a camera on the orbiting laboratory's rail car system were among tasks completed during their 6-hour, 31-minute spacewalk. Wearing Russian Orlan spacesuits, they moved from Pirs to the Strela hand-operated crane, and used it to move about the station's Russian segment. The Elektron vent repair was the first task. Because of a problem with that vent, Vinogradov had to reroute Elektron's hydrogen vent line to a vent also used by the Vozdukh carbon dioxide removal system. This repair will enable them to re-establish the vent line. The Elektron breaks down water into its components, hydrogen and oxygen. The oxygen is used in the station and the hydrogen is vented overboard. The repair, involving installation of a nozzle on the neck of a valve, was followed by a few minutes to photograph the area. Next Vinogradov removed a plate from the Kromka experiment. Kromka looks at contamination from thruster jet firings and devices to protect the station's exterior from them. While he was doing that, Williams removed a Biorisk experiment container from Pirs for return to the inside of the station. Biorisk studies the effect of spaceflight on microorganisms. Vinogradov then removed slack in a cable of an antenna on the Zvezda Service Module. The antenna is designed for docking of the unpiloted European Automated Transfer Vehicle, scheduled for its first launch next year. Meanwhile, Williams retrieved another contamination-monitoring device from Zvezda. The spacewalk's final and longest major task was replacement of a malfunctioning camera on the Mobile Base System, which moves the Canadarm2 robotic arm along the rails on the station's main truss. Both spacewalkers worked on that job. With the crew a little behind its schedule, maximum time for the spacewalk was extended so the task could be completed. Vinogradov and Williams secured the Strela before re-entering Pirs to conclude the spacewalk. It was the sixth spacewalk for Vinogradov and the second for Williams. 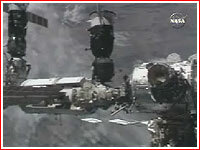 The crew re-entered the airlock of the Pirs docking compartment Friday at 1:19 a.m. EDT. 2006 August 03: Space Station crewmen Jeff Williams and Thomas Reiter conducted a 5-hour, 54-minute spacewalk. They installed and replaced equipment and set up scientific experiments outside the orbiting laboratory. They had a third station crew member for the first time in more than three years. Expedition 13 Commander Pavel Vinogradov coached them through their prebreathe exercise program and helped them suit up for their outing. The station crew was reduced to two members in May 2003 in the wake of the Columbia accident. Since then, spacewalkers have had to reconfigure station systems before donning their spacesuits without help. Williams and Reiter were coached during their spacewalk tasks by Astronaut Steve Bowen. He will act as spacewalk intravehicular officer from the International Space Station Flight Control Room in Houston's Mission Control Center. The first and longest major task of the spacewalk was installation of the Floating Potential Measurement Unit (FPMU). That device is designed to measure the electrical potential of the station so ways can be verified or devised to minimize arcing hazards as the ISS grows. Williams, designated lead spacewalker (EV1), wore the U.S. spacesuit with red stripes. Reiter, EV2, wore the all-white suit. They spent about half an hour setting up equipment. They then moved with the FPMU to a camera mount near the upper outboard end of the S1 (starboard one) truss. Next they moved back to the airlock. There they installed two Materials on International Space Station Experiment (MISSE) containers. MISSE 3 goes on one of the high-pressure tanks around the crew lock, while MISSE 4 is set up on Quest's outboard end. The experiment, housed in suitcase-like containers left open, looks at the long-time effects of space on a variety of materials. The idea is to identify optimal materials for use in future spacecraft. Williams installed a controller for a thermal radiator rotary joint on the S1 truss. Meanwhile, Reiter replaced a computer on S1. While Reiter finished that task, Williams began installation of a starboard jumper and spool positioning device (SPD) on S1. Reiter inspected a radiator beam valve module SPD site and installed one there, then moved on to install a port jumper and SPD. The jumpers are designed to improve the flow of ammonia through the radiators once that coolant is installed. Williams began setup for the final major task, test of an infrared camera designed to detect damage in a shuttle's reinforced carbon carbon (RCC) thermal protection. The camera is designed to detect damage by variations in temperature between sound and damaged RCC test sections. Williams did two get-ahead tasks. The first was installation of a light on the truss railway handcart. He then replaced a malfunctioning GPS antenna. After Reiter finished the infrared camera experiment with the RCC, he installed a vacuum system valve on the U.S. laboratory Destiny for future scientific experiments. The crew still had spacewalk time remaining, so Mission Control came up with more extra tasks. They included moving two articulating portable foot restraints to prepare for an STS-115 spacewalk, photographing a scratch on the airlock hatch and retrieving a ball stack, which connects hardware to the station, for inspection from PMA-1. The spacewalk ended with cleanup and airlock entry at 3:58 p.m. EDT Thursday. It was the third spacewalk for both Williams and Reiter. It was the 69th spacewalk to support station assembly and maintenance and the 22nd from the Quest airlock. A small spill of toxic but not deadly chemical onboard the International Space Station, ISS, sent its crew into the emergency mode Monday. The crew reported smoke and bad smell onboard the service module from the Russian segment of the ISS around 07:30 a.m. Eastern Time on Monday, September 18, 2006, prompting mission control to activate emergency procedures onboard the station. Mission control in Houston advised the crew that level of smoke did not require them to wear oxygen masks, however asked the crew to monitor the situation, as the readings of CO2 onboard were apparently increasing for several minutes. At 07:32 a.m. Eastern Time, Shannon Lucid, capcom communicator in Houston, ordered the crew to activate a set of emergency procedures known as "Atmosphere Recovery After Fire." The station's ventilation systems were shot down to contain the contamination of the atmosphere across the outpost. At around 07:41 a.m. Eastern Time, NASA astronaut Jeff Williams onboard the ISS, told Houston that only smell was detected and their original report about smoke onboard was a mistake. As it transpired, the problem was caused by the Electron oxygen-generation system, which discharged some amount of liquid potassium hydroxide, KOH, through its oxygen vent. The liquid is considered to be a toxic irritant, but not deadly. There was a report that the crew was working with the unit at the time of the incident, even though no maintenance of this system was scheduled at the time. At 07:45 a.m. Eastern Time, Pavel Vinogradov reported that no further discharge of liquid from the Electron has been taking place, and all contamination was cleared. The crew was wearing protective goggles, surgical masks and gloves, while cleaning up the spill with the help of blankets and rubber bags. At around 8:00 a.m. Eastern Time, the crew was working on the activation of the Vozdukh system, while a medical team in Russian mission control in Korolev requested Pavel Vinogradov to take air samples onboard the station. The exact cause of the leak was not immediately understood and NASA officials said they could need as much as 36 hours to recycle the station's atmosphere to a pre-accident level. The situation was not expected to affect a scheduled arrival of the Soyuz TMA-9 spacecraft, according to NASA. Potential causes of the smell onboard the station were eventually narrowed down to the overheated rubber gasket inside the Elektron unit, as NASA officials concluded potassium hydroxide liquid could not be the source. In the post-incident conversation with the mission control, Pavel Vinogradov said that initially just three of four drops of clear liquid came out of the oxygen went, followed by a somewhat larger spill, which produced three-centimeter paddle near the Elektron unit. The spill was accompanied by strong chemical smell. According to Roskosmos, the Elektron system was successfully reactivated on September 26, 2006, at 11:32 Moscow Time. 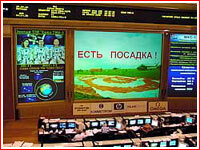 2006 Sept. 29: After 183 days in space, the crew of the 13th long-duration expedition onboard the International Space Station, ISS, safely landed in Kazakhstan, Russian mission control said. The Soyuz TMA-8 spacecraft, undocked from the station on September 29, 2006, at 01:53 Moscow Summer Time. Onboard were Russian cosmonaut Pavel Vinogradov, NASA astronaut Jeffrey Williams, both from Expedition 13, and American businesswoman Anousheh Ansari, who arrived to the station on September 20, 2006, onboard Soyuz TMA-9, as a space tourist. Braking engine of the Soyuz spacecraft was fired at 04:23:47 Moscow Time and lasted for about four minutes, directing the spacecraft into the Earth atmosphere. The reentry capsule with the crew separated from other elements of the vehicle at 04:47 Moscow Time and entered the Earth's atmosphere three minutes later. The Expedition 13's successors onboard the ISS were able to videotape the entry of the Soyuz TMA-8 into the Earth's atmosphere. After descent under a parachute, the spacecraft successfully touched down at 05:13 Moscow Time in the predetermined region 87 kilometers north of town of Arkalyk, Kazakhstan. In the post-flight interview with NASA TV, astronaut Jeff Williams said that during the landing the crew had established reliable radio-contact with the recovery personnel at the time when the capsule's parachute was just released or even shortly before that.